Another early rise, another proper breakfast, and since I was not going to be able to ride until we had had breakfast, I was determined to make a proper job of it this. 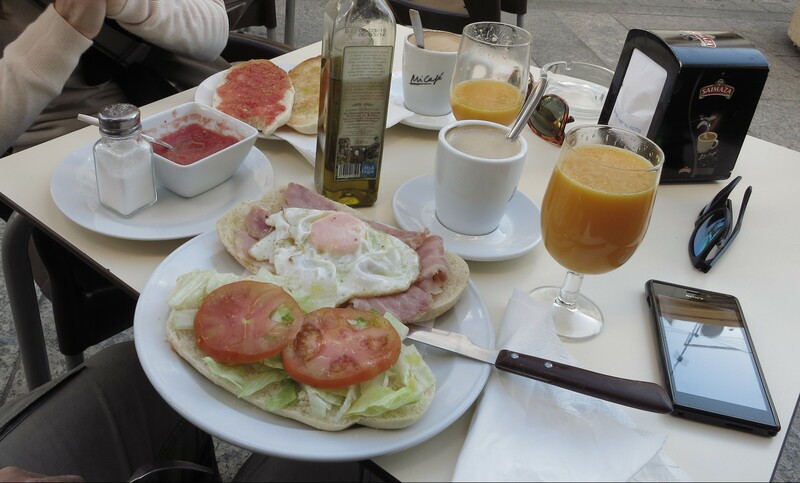 We sat at a terrace in one of the pedestrians only streets in the centre of Ronda and I ordered a full breakfast that included two big loaves of the local artisan bread, one with lettuce and tomato, the other one with bacon and a fried egg, coffee and freshly made orange juice. With our stomachs full we went to see the sights we had seen the night before, but this time in daylight, so we could fully appreciate how deep the gorge that the Puente Nuevo span was. The views from the middle of the bridge, looking down at the ravine more than a 100 metres below are impressive. Even though most of the pictures of the city that can be found on the Internet show the view of the bridge at a distance from below, when one approaches it from any of the main roads it is not visible at all, contrary to my expectations of turning out of a corner coming down from a mountain road and seeing the bridge suddenly come into view in front of me, but looking down from the top we saw a small country lane that went down to the point where the gully opened, so we decided we had to find a way to take it and see the most famous view of the bridge. It was not that hard, out of one of the gates in the old wall there is a small street that starts off the right, called Calle de los Molinos. It is a narrow cobbled street, and we had to be careful as it was quite steep and slippery. Near the bottom there is a small space where we could park the bike and take a walk up the gully to admire the bridge from below, which is maybe an even more imposing view, as it can be appreciated in all its imposing size. Back on the car park we saw a couple of friends who had just parked and were changing into climbing equipment, and they told us that there is a via ferrata under the bridge, and many more in the region. I took good note of that for a future visit. The road only led to some fields and the old mills that gave it its name, so we had to ride it back up again, and this time the difficulty were the cars and pedestrians that were coming down the other way, the sun already high encouraging people to come out and visit. 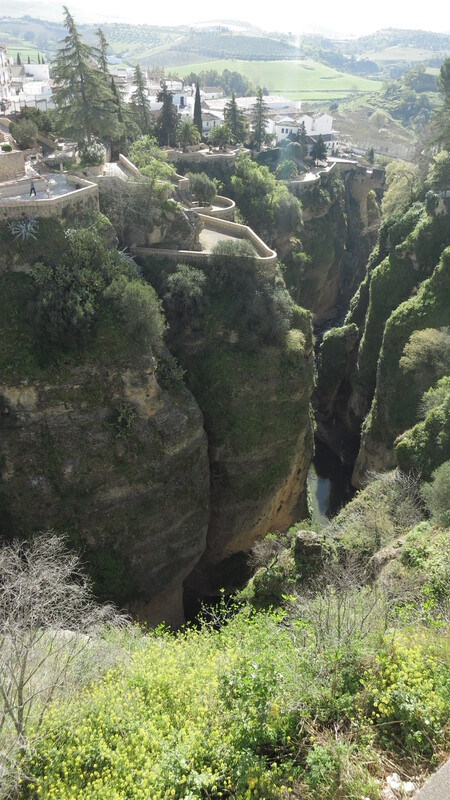 We had reached Ronda the previous day via the A-369, a great road, and the plan today was to take the other main road to the south of the city, the A-397 to Marbella. It was marked as a more important road on the map, and I was not expecting much, but it turned out to be absolutely marvellous, an opinion easily confirmed by the many bikers coming up the road we met. Luckily it seemed that most people were coming up in the morning either to visit Ronda or to ride the road and the traffic would be denser on the way down in the afternoon, so we were glad to find virtually nobody on our side of the road. I was not keen at all to visit Marbella, a place famous for appearing on the news perpetually on stories related to political corruption, and a refuge for the most tacky, shady, decadent kind of wealth in the country, but Nat accused me of being prejudiced and said that I could not judge a place without seeing it. Fair enough. 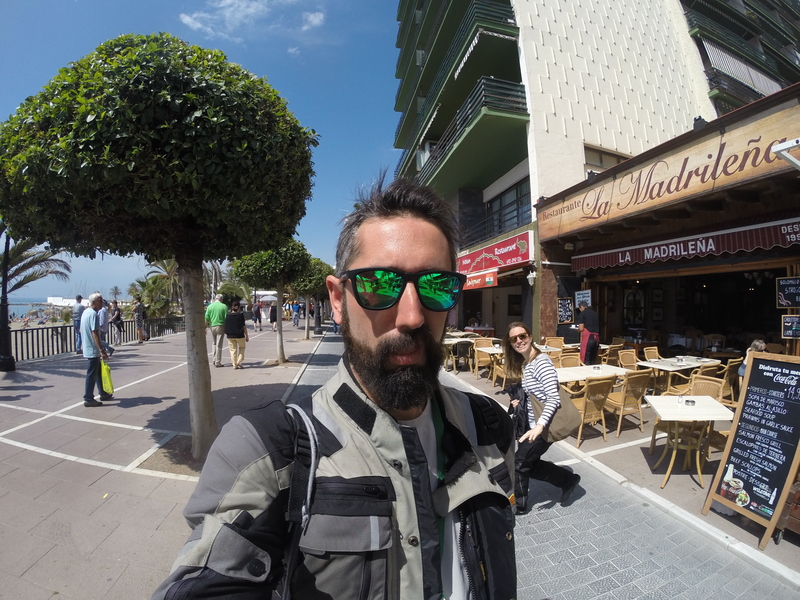 We rode into Marbella, parked the bike and went for a walk. It was exactly what I had thought it would be. “I told you so” and a wasted hour later, we were back on the road heading for Malaga. We took the coast road in order to enjoy some views, but out of everything I had seen so far, this is the one place I will never ever set foot on again. The landscape (it does not even deserve that name) was something like this: housing estate, housing estate, housing estate, industrial estate, housing estate, campsite, housing estate, golf course, housing estate, campsite, golf course, housing estate, industrial estate, campsite, industrial estate, golf course, shopping centre, housing estate, campsite, shopping centre, housing estate, industrial estate, shopping centre, golf course… I guess the coast must have been a beautiful place at some point, but easy money in the development business and a complete disregard for nature had destroyed it long ago. We got to Malaga by lunchtime and stopped at the first place we saw, called “La casita de la patata”. It had a terrace and I could park the bike in front of it, so I thought it would do. 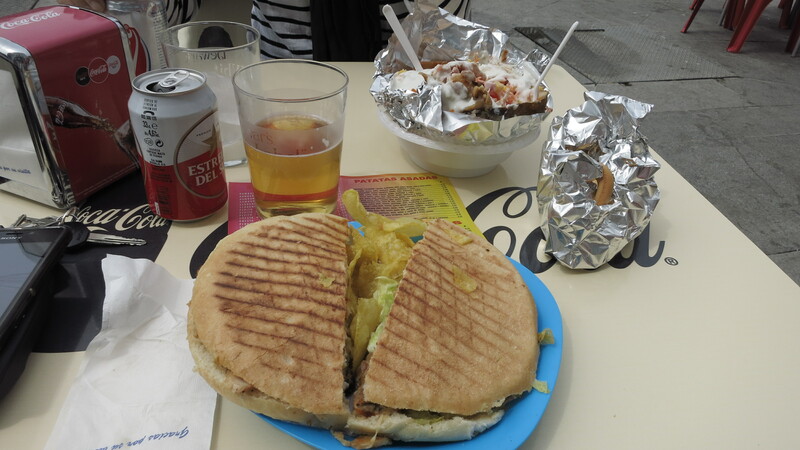 They served a sandwich that is typical from the city, called “campero”, made with a special kind of bread that has the same name. I order a meat one, and Nat ordered a vegetarian “individual” pizza. She also wanted some side snack, so she ordered what she thought were “patatas bravas”. A moment later I was served a huge sandwich, she got a pizza that could easily feed two people and the potatoes turned out to be one massive baked potato open and stuffed with meat, salad and sauce. So much for a light meal before hitting the road again… We tried our best to finish it all, but it was impossible, and those who know me can bear witness to how much I can eat. This was just too much. Needless to say, we had to drag ourselves across the road and lie down at a park overlooking the marina for at least an hour, Nat fast asleep and me reading my book. Once were able to ride again we left Malaga still following the coast road, but things were much better here. Old fishing towns had not been ruthlessly replaced by tall apartment buildings and the sea was visible from the road. It is true that it was not as beautiful as other parts of the coast, but it was a welcome improvement after Marbella. Our next and final destination, however, was Granada, which was inland, but I did not want to go all the way to Motril and take the motorway from there, so when we got to Nerja we turned off the coast road and headed up one of the small roads that crossed the natural reserve of the Sierra de Tejeda mountains. These are quite tall mountains despite their proximity to the sea, and the road leading to the top is very narrow and windy, following the shape of each drop, shoulder and gully of the rocky terrain. It was a fascinating landscape, especially once we reached the top of the pass and saw the other side. The contrast between the south and the north face of the mountains was as stark as sudden, the south face almost bare of vegetation, hard and aggressive, with sharp rock formations, the north face a series of gentle slopes covered in lush grass, clumps of trees here and there growing denser as we rode down towards Granada. The mountain road joined the main motorway right in the outskirts of the city, so we were there in a matter of minutes, and got quite far into the centre before finding the streets cut to traffic again because of the processions and learning that our hotel was right in the middle of it. We took a side street, parked the bike about five streets from the hotel, and took a walk. Luckily, things were better organised than in Jerez and there were crossing points regulated by the local police to help people get across the street without disturbing the procession. 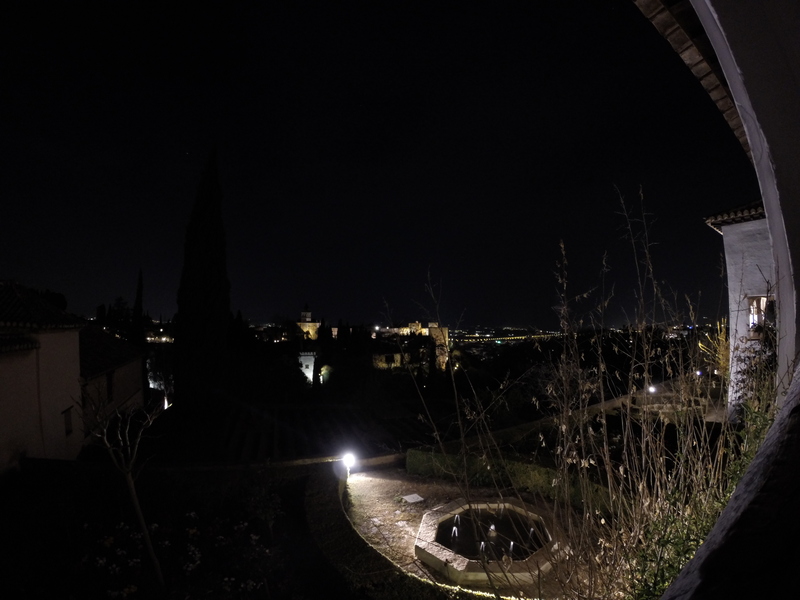 It was already quite late, so we only had time to have a good shower and put on some nicer clothes before leaving for a visit of the city’s main tourist attraction – the Alhambra. We had been warned about the number of tourists there and told to book our tickets in advance, but even so we had only managed to find tickets for a night visit to the gardens, not the whole place. Still, it was better than not being able to visit it at all and it would be quite a romantic thing to do at night. We did not have time to walk up to the entrance, which is a nice but long stroll uphill from the centre, and were told at the hotel that because of the processions it would be impossible to catch a bus, so our only bet was to take a cab. The driver also warned us that he could do no better than the bus across the city centre, and that he would have to drive out of the city, take a bit of motorway and approach the city from the other side. In the end it was only a 12€ fare and we got to the entrance 10 minutes before the visit, so it was not bad at all. The world is a small place, and a friend of ours from Barcelona was visiting an old friend from high school in Granada those days and had booked the same visit at the same time, so we met him, his friend and her boyfriend, and they gave us some valuable local insight during the visit. The gardens were a deeply relaxing place to see at night, softly lit, the sound of water running from the many fountains in the gardens, the city lights at our feet. Once the visit was over, and without any hurry now, we walked down back leisurely to the city centre in search of a good place to enjoy the famous city tapas. Local advice was invaluable again, and they took us to their favourite places, away from the tourist path where we experienced firsthand what we had always heard – you can live in Granada without ever paying for dinner; you simply need to order a drink and you are served a generous and usually quite elaborate tapa for free, which means that you can just go out late afternoon or early evening with a bunch of friends, have a few drinks and go back home with a full stomach. Our friend’s friend was pregnant and they were getting up early to go to the beach the following morning, so they headed home, but he stayed with us for one last beer. And as it is usually the case when the sentences “one last beer”, “I’m taking it easy tonight” or “I’m not drinking tonight”, we lost count of the beers we had, which later turned into gin and tonics, and we spent the whole night dancing and drinking. By the time we got back to our hotel it was almost daylight and we felt as if had already been in the city for a week. 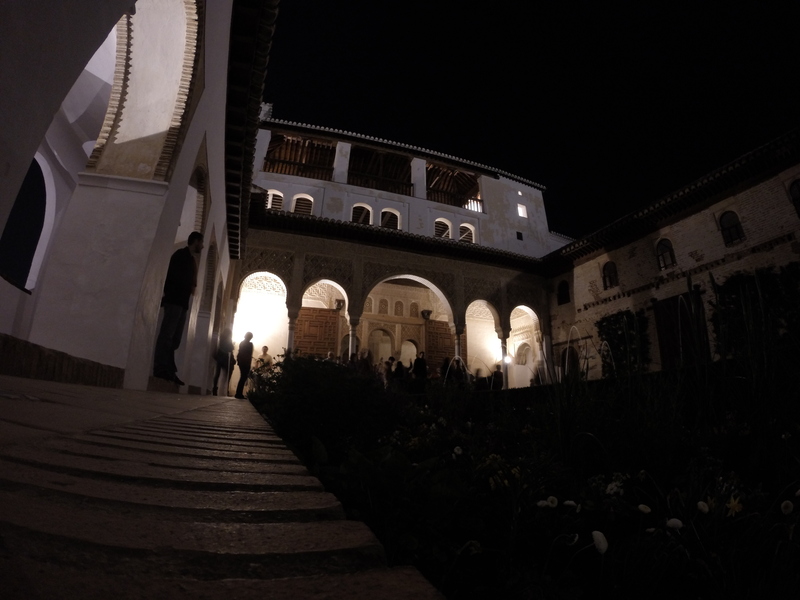 This entry was posted in Portugal and Southern Spain 2015, Travel and tagged Granada, Malaga, Marbella, Puente Viejo, Ronda, Tejeda by Kilian. Bookmark the permalink.